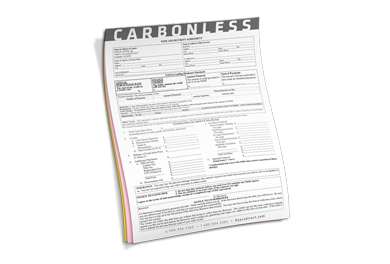 NCR Forms are an alternative to carbon paper used primarily to make a copy of an original, handwritten document without the use of any copying equipment. A well-designed NCR Form is an invaluable and cost-effective way to duplicate your company’s forms, contracts, receipts and work orders. Many industries and companies, for instance HVAC, Plumbing, Contractors & Builders, Dentists, Window Treatment and Pest Control to name a few, benefit from using NCR Forms as part of their day to day operations. First create a new document and set it to the canvas size listed above. Your bleed area is 1/4th” from the edges. Keep all type within safe area.